The North American Handmade Bicycle Show (NAHBS), the world's largest consumer show for custom-built bicycles, invites the public to buy a raffle ticket for a very special handcrafted bicycle built by a team of nine of the most esteemed frame builders in the world. The team, which will raise money for the Juvenile Diabetes Research Foundation (JDRF), includes renowned frame builders Brian Baylis, Roland Della Santa, Doug Fattic, Bruce Gordon, Tom Kellogg, Andy Newlands, Mark Nobilette, Richard Sachs and J.P. Weigle. Selected based on quality, craftsmanship, reputation and artistic impression, these famous builders will draw on over 290 years of combined experience to create a one-of-a-kind bicycle in the first collaboration of its kind. The bicycle, to be custom-fitted and built for the lucky winner of the raffle, will include a set of Pacenti Original Lugs, a Columbus tubeset from Nova Cycles, Richard Sachs dropouts, a Campagnolo Record Group, Phil Wood hubs, an ultra-smooth finish and detailed lugs and joints by each artisan. This undertaking was organized in honor of Tessa Walker, daughter of NAHBS founder Don Walker, who contracted juvenile diabetes when she was 5 years old. She monitors her blood sugar several times daily and is now 16 years old and living with Diabetes. "I am touched that such a great group of artisans are contributing their efforts on behalf of the JDRF. Their partnership in this project to benefit the search for a cure to Juvenile Diabetes means a lot to Tessa and me," said Don Walker, founder of NAHBS. 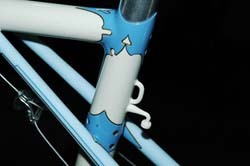 Raffle tickets are now on sale at the NAHBS website, www.handmadebicycleshow.com, for $20 each or 12 for $200. The drawing will be held at the NAHBS show in San Jose on Saturday, March 3rd at 4 p.m. The lucky winner need not be present to win, but raffle participants are encouraged to attend, meet the world-class builders who put it together, and get fitted then and there for the frame. JDRF will receive 100% of the proceeds. Your donation to the Juvenile Diabetes Research Foundation is important in helping find a cure for this disease. The North American Handmade Bicycle Show is dedicated to showcasing the talents of individuals around the world whose art form is the bicycle. It aims to be a gathering point  online and in person  for frame builders and consumers looking for custom-made bikes, for the sharing of ideas and promotion of this special industry which has such a rich history. After two years of growing by leaps and bounds, NAHBS 2007 will feature still more exhibitors, consumers and a wealth of seminars. For more information, see www.handmadebicycleshow.com,.